PivotTables Direct From your SharePoint List Data. 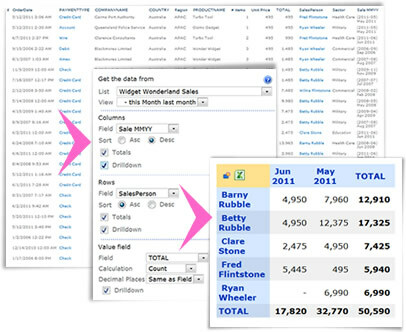 PivotPoint allows you to create PivotTables directly from your SharePoint list data. There is no need to export your data to Excel, then bring it back in to SharePoint using Excel Services. With PivotPoint you simply apply the web part directly to any list or library, configure in a few clicks and publish your table to any SharePoint page. And better still, because PivotPoint is reading directly from your SharePoint list it refreshes automatically as your list data changes. If you have ever been through the process to creating a Pivot Table in SharePoint using the Excel method you will realize just what a benefit this is.